Wooden Window Boxes and Window Box Brackets. We also supply elegant window box wall brackets that complement this window box sold separately. These are supplied with screws and rawplugs. 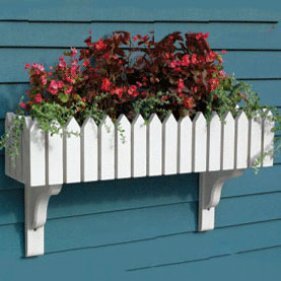 The Buckingham Wooden Window Box is perfect for any window ledge, wall or fence. 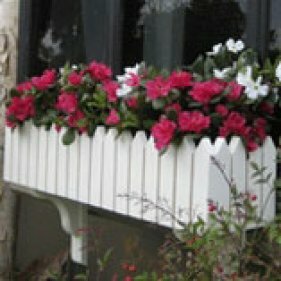 The design is taken from a picket fence will accentuate the beauty of your plants and flowers whilst looking good in its own right. 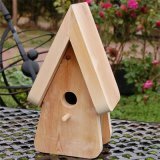 Buckingham windowboxes are made from Scandinavian red pine with holes in the base for good drainage. The windowboxes can be finished in clear, golden brown, wild sage or white preservative. We also offer a selection of Farrow & Ball paint finishes. Growing plants in windowboxes is easy and rewarding. With food, drink and a snug windowbox, your displays will flourish from season to season. once the plants have passed their peak. You don't need to feed plants in winter even if they still look good, because they are in active growth. Foliar feeds are liquid fertilisers in a highly diluted form capable of absorbed through a plant's leaves; these are useful to boost performance for a for a special occasion, or as a pick me up. For windowbox cultivation, it is best to use slow-release fertiliser, since your plants will be in the same compost for at least a season. You can mix slow-release feeds into your compost at planting time. Alternatively there are special hanging basket slow release feeds in tea bag form designed to be included when you plant.